PHOENIX (AP) — Stephen Drew hit an inside-the-park home run and Dan Haren held San Diego to three hits in seven innings in the Arizona Diamondbacks' 6-3 win over the Padres on Monday. For the second year in a row, someone hit an inside-the-park homer on opening day — former Diamondbacks player Emilio Bonifacio did it for the Florida Marlins last year, which was the first one after 41 years. Mark Reynolds hit a two-run homer, the only earned runs among the six given up by San Diego starter Jon Garland (0-1). Haren (1-0) allowed one run and struck out four without a walk. He threw 20 of 24 first-pitch strikes and had a three-ball count against only one batter. Adrian Gonzalez and Kyle Blanks hit consecutive two-out homers off Bob Howry in the ninth for San Diego. Haren retired 19 of the first 20 batters he faced, including 15 before Gonzalez doubled with one out in the seventh. Chase Headley's two-out RBI single ended the shutout. Garland, in his first opening day start, gave up five hits in four innings, walking two and striking out four. A starter for Arizona last season before being traded to the Los Angeles Dodgers, he is 4-7 at Chase Field. Drew's was the sixth inside-the-park home run in the franchise's 13-year history and the fifth by any player at Chase Field. With two outs in the fourth, he hit Garland's 2-2 pitch high and deep. The ball caromed off the balcony over the right-center wall and far away from Padres' center fielder Tony Gwynn. By the time left fielder Kyle Banks chased down the ball and threw it to the infield, Drew was halfway between third and home. Haren scored ahead of him from first after reaching on the third baseman Headley's error. The Diamondbacks got two unearned in the first, thanks to shortstop Everth Cabrera's fielding error. Drew singled, then Justin Upton hit what should have been an ideal double-play bouncer just to the left of second base. But Cabrera bobbled the ball and both runners were safe. Reynolds walked to load the bases, then Miguel Montero lined a two-run single to right. In the third, Upton singled with one out, then Adam LaRoche struck out swinging for the second time. That brought up Reynolds who, coming off a 44-home run season, hit the first pitch high and into the left field seats. Matt Stairs appeared as a pinch hitter for the Padres in the eighth inning to tie a major league record by appearing for his 12th major league team. NOTES: Recently retired Arizona Cardinals quarterback Kurt Warner threw out the first pitch. ... 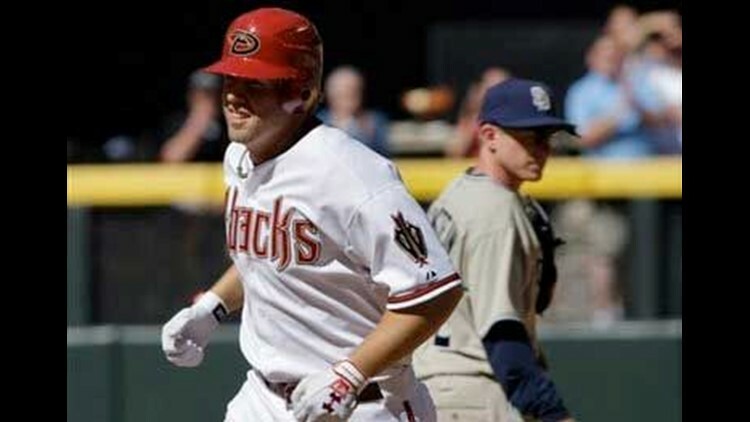 The last inside-the-park homer for Arizona was by Kelly Stinnett on Aug. 29, 2005 at San Diego. The last one at Chase Field was by the Cubs' Derrek Lee on Aug. 26, 2007. ... The game was announced as a sellout of 49,192, although there was a smattering of empty seats in the upper deck.